Each ArtQuest specialty has assembled a collection of gifts just for you. Buy raffle tickets below for a chance to win one of these exiting baskets. Tickets are $5 each. Increase your odds by purchasing multiple tickets. Winners will be drawn at random on May 6, 2019. Winners will be notified be phone or email and items will be available for pickup at the ArtQuest office. ArtQuest T-Shirts with New Designs! Use the PayPal buttons below to purchase ArtQuest T-Shirts. Once we receive your order, we will let you know when you can pickup your shirt(s) in the ArtQuest office. We can usually have them ready 1 to 2 days after your purchase. 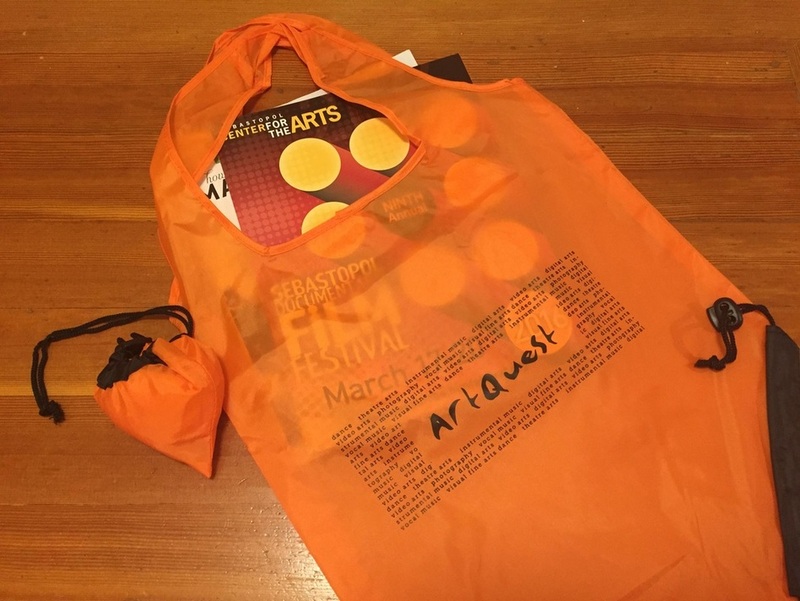 ArtQuest Reusable Shopping Bags ... Only $5/each! ArtQuest @20 Anthology - Now Only $20! The ArtQuest 20th Anniversary Anthology, a beautiful bound special edition book showcasing some of the finest student work that connects to our 2014/2015 "ArtQuest@20" theme is available for purchase now. This beautiful book contains over 130 pages of carefully selected student artwork, plus an exclusive link to an online showcase of work from the Dance, Digital Arts, Instrumental Music, Theatre Arts and Vocal Music specialties. All work has been carefully selected by a jury of our facility to embody the quality and spirit of the ArtQuest experience. This is your chance to own a piece of ArtQuest history. The Anthology is a wonderful keepsake and makes a great gift. This is a limited edition, one time printing that will not be repeated. Buy yours today, before they are gone! Buy online, then bring your receipt to pickup in the ArtQuest office. Use the PayPal link below to buy yours today.